Patrol Sector 25 with Fireball XL5! Konami's Super Premium Pack is a great combo of S.I.D. from UFO and either Fireball XL5 or a Rescue Eagle from Space: 1999 - but what if you only want Fireball?! FAB Gear is selling each model separately! 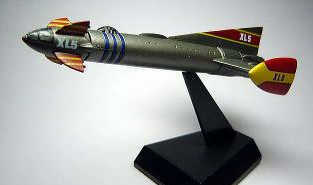 Fireball XL5 is approximately 3-4 inches long and comes pre-painted with minimal snap together assembly required. Fireball Jr. is removable, and the model comes with a black styrene display stand. Been looking for a desktop model like this. It's only 5" long, but that's perfect. Very detailed and well made. Fireball Junior even detaches! When I was very young my favorite TV show was "Fireball XL5", produced in England by Gerry Anderson. The show featured everything a 5year old in the early 1960's could ask for, a robot co-pilot, alien invaders, a heroic astronaut pilot named Steve Zodiac. Best of all was the coolest rocket ship ever built. The Konami model is the perfect size for my desk and nicely detailed.